Recently, representatives from iKeepSafe (Generation Safe is their assessment tool, resource library, and incident response tool), a company that provides tools dedicated towards responsible digital citizenship, held a workshop for ISTP's "e-Safety Committee", a group of faculty and administrators who are charged with integrating digital citizenship into our curriculum. In addition to our trainer, Emily Enseign, a content editor for iKeepSafe, we had the privilege of spending a few hours with Marsali Hancock, world renowned expert, speaker, and CEO/President of iKeepSafe. Kate Lussen, Assistant Head of School, said, "the workshop first and foremost provided us with a wealth of resources to help and guide us in how we approach both digital citizenship and cyber safety. We discussed real-life scenarios and examined ways of connecting even more with our students in regards to their digital lives." Middle School Dean Robert Henshel believed the workshop was helpful because, "it provided a framework from which we, as a community, can help students, parents, and teachers to both preemptively and reactively address the growing needs to protect and empower our students in this ever-changing digital age." Kate added, "it was nice to see that we are well ahead of the curve in terms of our systems and approaches that we have in place, and to gain more ideas of how to integrate the concept of digital citizenship into our curriculum." 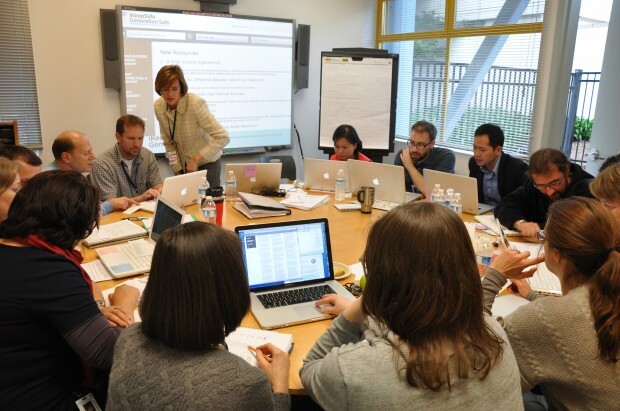 The e-Safety Committee was established in 2010, after faculty and administrators attended a 2-day digital citizenship workshop at the Santa Clara County of Education. After coming back from the workshop, the committee was established, and according to Mathieu Farrugia, IT Director, "we want to continue to have workshops and trainings and assess, review, and develop policies and strategies, as well as review and promote resources internally around the themes of digital citizenship and cybersafety. It's our responsibility to also inform faculty, staff, and administration on how to deal with incidents involving cyberbullying, including building relationships with local law enforcement and legal council in case those resources might be needed."